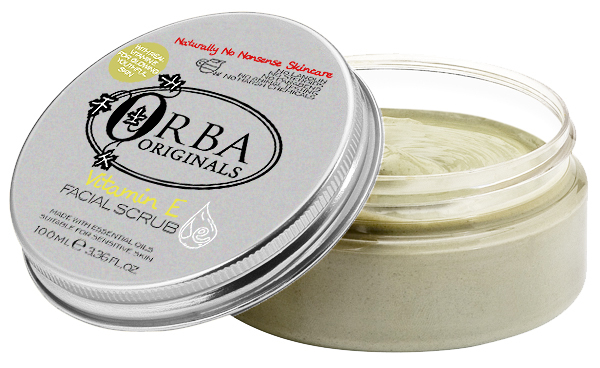 Natural Facial Scrub Natural Face Scrub  - £16.99 : Orba Originals - Naturally No Nonsense Skincare! Gentle Exfoliation and Skin Conditioning Treatment. A multi tasking scrub fortified with walnut shell granules to remove dead skin cells and stacked full of Vitamin E to detoxify and clarify skin. Gentle and non-irritating this scrub has been carefully formulated for everyday use. This circulation boosting blend deep cleans pores by purging skin of accumulated impurities and scrubbing away dead skin cells to reveal radiant looking new skin. Vitamin E stimulates cell renewal and refines the skins surface while Rose essential oil and Allantoin detoxify and clarify the complexion to leave it refreshed, relaxed and glowing. Repeated use brightens skin, enhances circulation and releases the skin's natural vitality. Use two to three times a week. Dab a small amount of Vitamin E Facial scrub into the palms of the hands, rub together then smooth over face and massage gently into dampened skin. Rinse thoroughly. For best results conclude treatment with Vitamin E Face cream. Aqua (Water); Cetyl Alcohol (Coconut/Palm Kernel Oil); Isopropyl Myristate (And) Stearic Acid (And) Cetyl Palmitate (And) Coconut Acid (And) Cetearyl Alcohol (And) Glyceryl Stearate (And) Potassium Stearate (And) Potassium Cocoate (And) Sodium Stearate (And) Sodium Cocoate (Coconut/Palm Kernel Oil); Vitamin E Oil; Walnut Shell.